A guide devoted solely to ‘Purely Paleo Skincare’. Who thought of such a wise concept you may ask?! 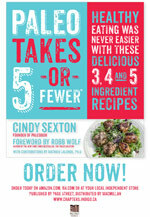 Well wonder no further…it is the brilliant masterpiece of no other than the lovely Liz Wolfe (NTP) of CaveGirlEats. Although Liz and I have never met in person, I can just tell that she would be such a cool gal to hang out with. Okay…so let’s cut to the chase. Who is this Liz gal anyways?!? What’s her deal? What’s her story?!? What is she all about? 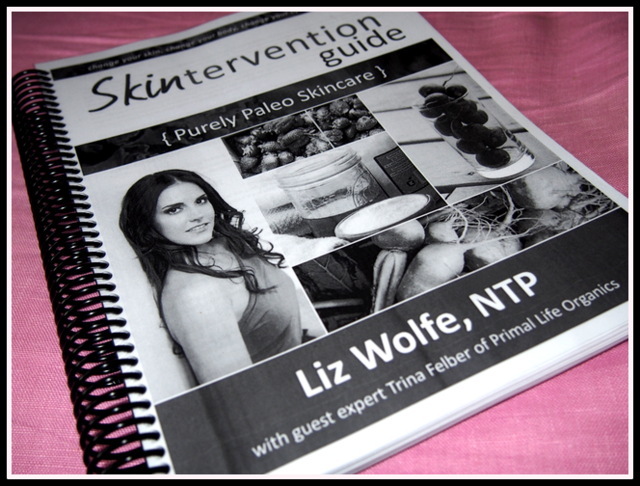 * I also want to pay tribute and note that Trina Felber of Primal Life Organics (skin care genius) also plays a huge role in sharing her excellent expertise and offers insights throughout the guide that address various skin-related conditions. Be sure to check out her ever-growing line of nourishing skin care products here! 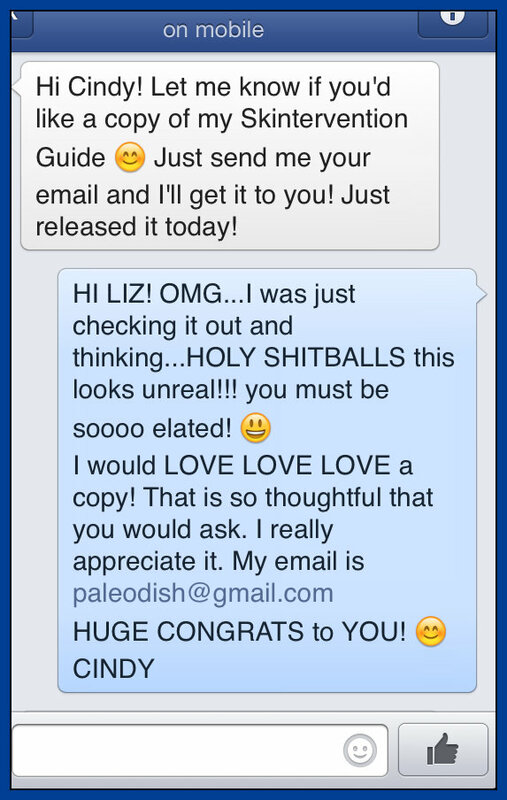 SOOOOOO…way back in Jan (I know…it has been months already…very *sadface*), Liz sent me a FB msg asking if I would like a copy of her newly released ‘Skintervention Guide’. As you can see below (photo), I was immediately thrilled with this kind offering. My lag in posting this review holds no real ground for any excuse. In all honesty, I was blown away with this guide from the moment I clicked ‘download’. New job…family commitments…training…and you know, life (blah…blah…blah), I could go on…(all excuses), but the real reason for the elapsed time in posting this, was because I wanted to take in all that Liz was providing and start an experiment with myself. My desire was to absorb and apply all she was saying and start playing around. Previous to being exposed to this guide, I was curious (and making slight changes in my beauty regime), but this book gave me the inspiration and kick to take that next plunge. A dive that I can now fully support, and share and recommend with pride as it based on my own personal results. I can confidently say, that I am so elated with my ‘skintervention’ progress to date. It is a process (as Liz mentions many times in her book), and is something that cannot be rushed or hurried. Thoughtful consideration is needed. The second excuse, I mean reason for me taking so darn long to post this, is not without good intention. This book is SO impressively packed with a crazy unbelievable amount of information. I would open it, read, close it, open it, read, close it…you get the idea. Finally, one day…the lightbulb went off…I needed to print this bad boy off. Ya, that’s right, send it to the printers and coil bind this number, so that I could mark the $hit out of it! Yep! That’s right…that’s me. That’s how I learn…I am such the ‘hardcopy’ kinda gal, who needs to be able to hold the book, highlight and do little jot notes here and there with my fancy pink marker. So…that’s what I did! And that was the perfect combo!! Utilizing the e-book especially for it’s amazing links, and adding this to my own ‘print version’ served to be an excellent companion. 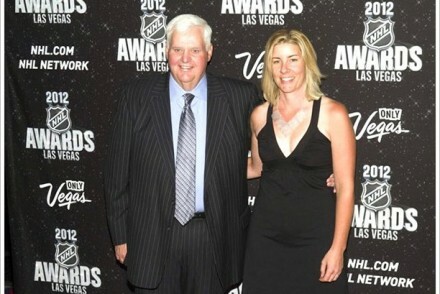 BTW…YES, this is legal, I asked her. Can you say FULLY LOADED? YEP…this digital resource is jammed packed with tons info ~ guaranteed that there is something in there for everyone! This meaningful and carefully crafted, three-pronged approach is designed to help you and your skin heal from both the INSIDE and the OUTSIDE! SO IMPORTANT!!! Includes multiple hyperlinks ~ who doesn’t love clicking around and exploring the internet this way – they are SO FUN! Oh ya…because it is a digital PDF, UNLIMITED lifetime updates are also yours FREE! The RESOURCE guide in itself is a total gem ~ there you will find Liz’s guaranteed recommendations + top picks! As a total non-fiction lover, sub-headings/bolded text are key! Liz does a great job of breaking down each section into manageable bites of information that don’t leave your head spinning ~ not bombarding in the least!! A gradual approach is reinforced throughout THE WHOLE guide ~ but I especially enjoyed the 3 levels of entry that are introduced in the ‘Body and Skincare’ section ~ 1- ‘Simply Boost’, 2- ‘Added Boost’, and 3- ‘Total Nourishment’ ~ choose your own adventure! If you are in a rush…reading the ‘Simplify It’ and ‘Wrapping It Up’ sections will serve you well and help you understand the gist of things – a very clever summary-style addition! Prior to reading Liz’s ‘Skintervention Guide’, my husband and I had made a few changes here and there with regards to improving our overall digestion and the health of our skin/body. Having said that, this guide is REALLY what has gotten the ball rollin’ though! To echo Liz’s sentiments, everyone has to find a personal approach and speed that works for them. That is what we are doing and couldn’t be more excited! Picking away…and seeing results!!! 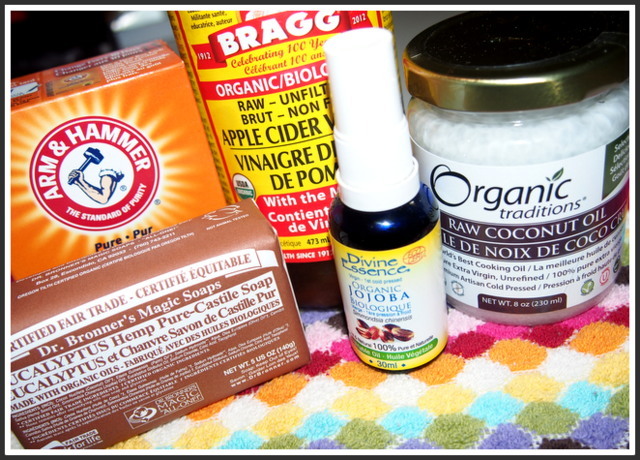 I now use these products from 100% pure, Vauxhall Gardens (Brickworks Farmer’s Market) and am going to place a BIGA$$ order with Primal Life Organics SOON! Said ‘BYE-BYE’ to Dove Soap…and now use Dr. Bronner’s! We started taking Green Pastures Fermented Cod Liver Oil/Butter Oil Blend ~ LOVE IT…have noticed such a difference. Where has this been all my life! Started something new – YEP…we both joined and started yoga/meditation classes ~ ohhhhhh soooo relaxing! Gave up coffee (a year ago now), and have switched to drinking nourishing herbal teas and kombucha & more kombucha! FINALLY…who couldn’t forget ‘dry brushing’! YES…that’s right…we have HIS and HERS and use them regularly before bathing!!! Energy levels are up ~ feeling invigorated and ready to do more!!! Want to find a ‘more natural’ toothpaste that we actually LOVE! Nothing about this guide is ugly…it’s ALL beautiful ~ well except for one thing! The one ugly thing that this guide addresses, is the ‘LIES THAT WE ARE TOLD’. Both Liz and Trina discuss how we as consumers can often be duped into thinking certain products that are labelled ‘healthy’, ‘natural’ or ‘organic’ are actually benefiting our bodies in a positive way. In many cases they are not! Tons of everyday products that we use on our skin, on our body, on our children bodies and within the 4 walls of our homes are filled with nasty garbage-like ingredients. Chemical derivatives that even an ‘English Major’ has difficulty pronouncing! What exactly am I talking about?! This is just a small sample. Go ahead – have a read. Pethylparaben, butylparaben, propylparaben, isobutylparaben, ethylparaben, diethanolamine, dibutyl phthalate, butylated hydroxyanisole, butylated hydroxytoluene, P-phenylenediamine, polyethylene glycols, petrolatum, cyclohexasiloxane, IMIDAZOLIDINYL UREA, METHENAMINE, or QUARTERNIUM-15, ethylene oxide…and the ever famous…sodium laureth sulfate! And…this is honestly just the tip of the iceberg. I am not trying to scare you with ‘fear mongering’ tactics, but rather the opposite! I wand to remind you (as I was) that you have the control to take the reins and explore alternative treatments. Ones that will not ‘break the bank’ (if fact you will save $) and ones that don’t focus on ‘Band-Aid’ solutions (long-lasting!) SOOOOOOOOOOOO…If you are struggling with acne, eczema, dry skin, body door, psoriasis, dandruff, ingrown hairs, discoloured patches, brittle nails, thinning hair, bad breath, cold sores, rosacea, whiteheads, blackheads, enlarged pores (me), dry skin, scarring, wrinkles, aging or dark circles/bags under your eyes…THEN THIS GUIDE IS MOST DEFINITELY FOR YOU!!! BUY IT ~ I HIGHLY RECOMMEND IT! START TREATING YOUR LARGEST ORGAN WITH THE RESPECT IT DESERVES. ENJOY!!! THE END! I am thrilled to announce my very FIRST GIVEAWAY EVER!!!!! YAY! 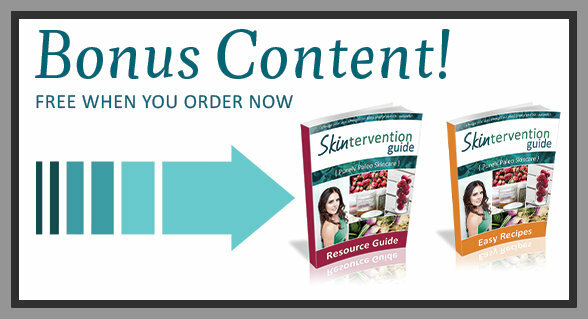 This WICKED ‘Skintervention’ Guide (a VALUE of $ 37) could be YOURS for FREE! All you have to do is share a comment below on my blog…telling us what you do to nourish your skin and body! CONTEST ENDS MONDAY AUGUST, 19 at 2PM. One entry per person. Winner will be contacted by email. GOOD LUCK!!! Hi there! I nourish my skin and hair with 100% pure oils like coconut, argan, or olive. I also use the “no poo” method 90% of the time, and use natural body washes and soaps as well. Inside, I treat myself to no gluten, limited grass fed dairy, and plenty of healthy fats. I also drink lots of water. 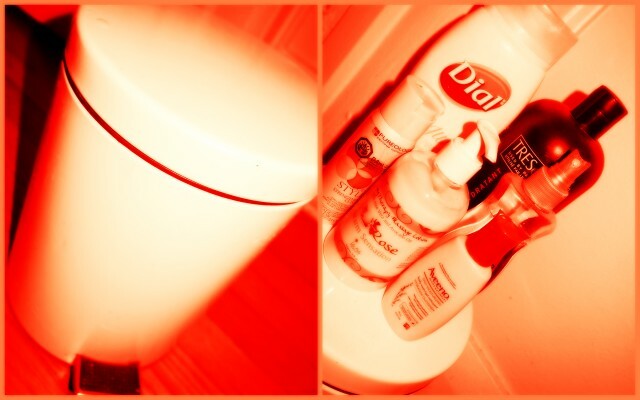 Do the no poo thing! My hair is amaaaaaaaazing now! (even my stylist has reluctantly agreed that giving up shampoo has made my hair much healthier). I cleanse with coconut oil and Dr. Bronners and then I use Green pastures beauty balm every night. .. and take cod liver/butter blend daily. Would love to win this book. .. haven’t had a chance to purchase yet! To nourish my skin and body I have cut out wheat for over a year now and have lost over 50 lbs, I cut out processed foods, I oil cleanse my face, and I am currently on day 8 of the 21 day sugar detox. I would love to win this book; I’ve been coveting it since its release. I am slowly working towards more natural care of my skin after a lifetime of acne and every drug imaginable to treat it. I eat so well I figure the skin care is next. Thanks for the giveaway! Liz is such a doll and this guide looks completely phenom. I love this review, it’s pretty much how I would describe Liz as a person based on my exposure to her personality through the podcasts and her website/FB. Looking forward to the tips here because I want to get away from chemicals that I can’t pronounce on my skin!! Thanks so much for creating this!! I would love love love a copy of Liz’s book. I listen to her podcast, have started oil cleansing – using castor and olive oils – and am super happy with the results. Committed to going chem free this year! Pick me! I use coconut oil! 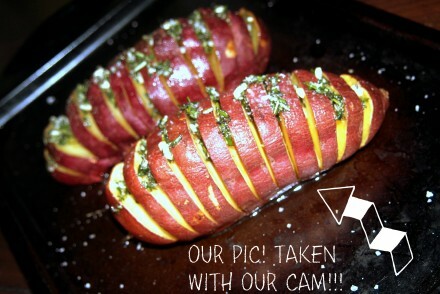 Hair, skin and eaten! I love living the paleo lifestyle! I think this e-book would be amazing to have. You and your website is amazing. hi! i’ve been sleeping with an eye mask and white noise machine, also with thin blankets so i can easily remove or add and get the best night’s rest possible. I absolutely LOVE Liz! She is so funny and seems like a genuine person. I am also a huge fan of the BB podcast. Thank you so so much Cindy for this rad giveaway! To nourish my skin and body I do a couple of things. I try to avoid irritating foods and stick to clean, healthy real food meals. I eat plenty of good quality fat and nourishing meats and veggies. I’m so excited about this giveaway! The Skintervention has been on my wishlist for ages now. I am loving using coconut oil as a moisturizer. And I just got some Aztec Clay and did a face mask mixing that with Braggs….my skin felt amazing afterward!! Hi Cindy! 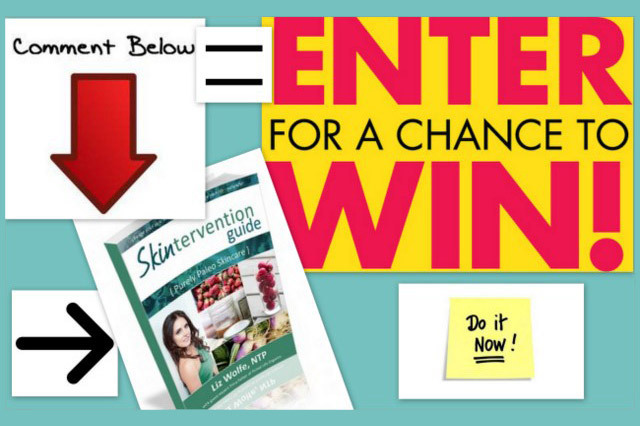 Thank for the chance to win The Skintervention Guide! I was hesitant about getting it (even though I know it will be a huge help) because it was digital but now that I know you can print it out! I’m definitely getting it (or, hopefully, winning it). Right now, I’m using the oil cleansing method, no poo and cod liver oil supplements! I use to use the typical face wash and lotion purchased at the local beauty store. I am slowly starting to convert to natural products. My first change was using Braggs apple cider vinegar mixed with water to use as a toner, then I switched to using Argan oil for my face moisturizer. However, I am looking for more ways to care for my skin naturally. I’ve started using baking soda as a cleanser and olive oil as a moisturizer and have seen a dramatic change in my face. I would live Skintervention! After using Proactiv for nearly a year and not seeing many results, I started using coconut oil to “wash” my face in the morning and before bed. Even after just a week, my skin is glowing, dry skin is gone and breakouts are less. Can’t wait to see what other wisdom that Liz has in this guide! 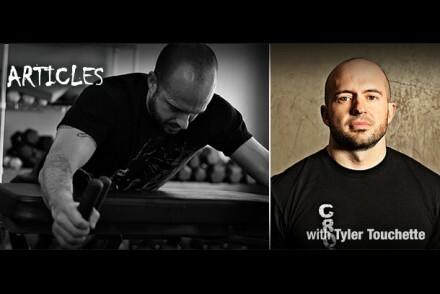 Since switching to a paleo/primal lifestyle a year ago, the results have been amazing. I read about the oil cleansing method on one of the many blogs I now follow regularly and have been using coconut oil exclusively for about 4 months now. I used to always get comments on my skin, but people comment even more now, asking if I’m pregnant because I’m glowing! I would love this – it would be incredibly helpful! I use coconut oil on my face and body. I also sometimes use Avalon Organics lotion on my skin, lavender scent is nice and relaxing. Also I use sunscreen and drink plenty of water! I am still experimenting with my skin, definitely working on cleansing from the inside out. I am very prone to food (i.e. dairy and sugar related break outs). 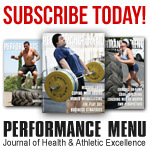 Very interested in this guide and the tie to digestion! Sick of all the marketing and products that are ‘natural’. 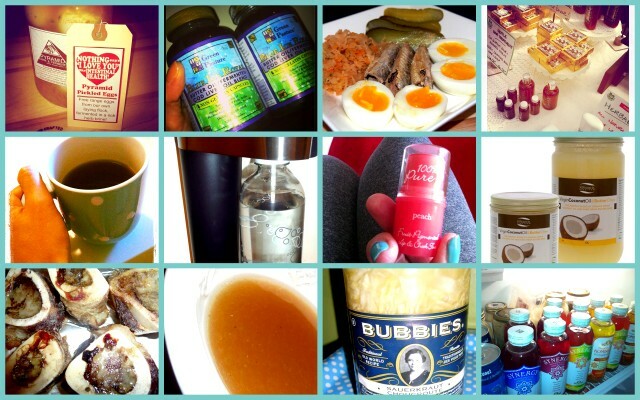 I eat fermented foods as much as possible! 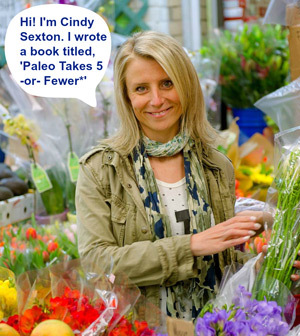 I eat paleo to nourish from the inside and use coconut oil to nourish from the outside! I so want to try the Skintervention. I am a firm believer that true health and happiness comes from what we put inside us as food and on us. Please pick me, pretty please! I’d love to find a moisturizer for my skin that doesn’t cause me to break out or get funny clogged pores! Another huge Liz fan here. Have been listening to Balanced Bites since episode one and totally rethought my philosophy on health and beauty thanks to the information Liz and Diane share. 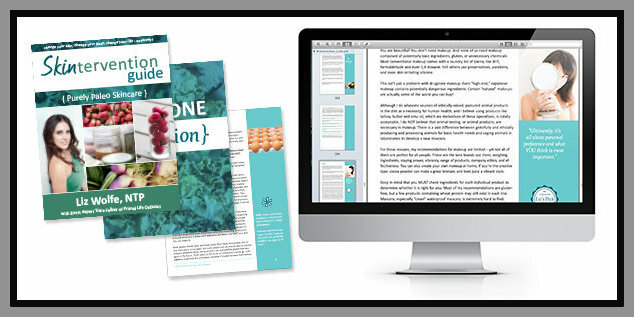 Would love to win the skintervention guide as it looks an amazing resource and admittedly I suffer a little from information overload with all the different tips and recommendations there are online. At the moment I’m trying to care for my skin by doing Practical Paleo’s 30 day autoimmune plan, coming off hormonal birth control and reducing my personal hygiene products to coconut oil, ACV, baking soda, honey and homemade sugar scrubs. Want to move to a more natural way of treating my skin. This book sounds amazing. Have some acne scar and some reoccurring break outs. Thanks for the giveaway. I nourish my body by eating paleo and taking fermented cod liver/butter oil. I nourish my skin by using natural cleansers with nothing artificial in them and moisturizing with jojoba oil. And I just ordered several samples of 100% shea butter to try on my really dry spots. I’d love to get this guide so that I can take the next steps, including natural makeup and hair care. I use coconut oil to cleanse and take fermented cod liver oil butter oil blend daily. I cleanse my face, religiously twice a day and drink lots of water every day. I’ve been no-poing for over a year and a half, and my hair is amazing. I’ve also been using coconut oil mixed with bees wax for my skin, also wonderful. I’m looking forward to using more natural products. Thanks for this review! I too am a big Liz fan but have not been able to get the Skintervention guide and I would love a copy!! To nourish my skin I eat a nutrient dense diet (Paleo), all natural lotions (homemade from a combination of oils, shea butter or cocoa butter), baking soda toothpaste, Grandma’s Lye soap, still on regular shampoo and conditioner but did try (and failed) the no-poo method, and soap nuts for laundry (tell your husband he will love them once he gets used to them, and you can use a washcloth with a few drops of essential oils in the dryer for a scented finish). I am 7.5 months pregnant and have a 3 year old, so incorporating relaxation and rest daily is a challenge, but I do my best to get at least a 30 minute walk in at work every day and meditate for a few minutes in the morning. I have had eczema for as long as I can remember. Despite about a year and a half of nutrient dense eating, I am still having frequent flares. I recently had a food intolerance test done and I am intolerant to a LOT of food (including cod which means no more FCLO for a while 🙁 ). I am hoping the Skintervention Guide will offer some additional guidance or encouragement to continue on the path I am on now. I just need some relief! Thanks for putting this giveaway together! I am trying to drink more water! I think that will help my skin and body! I have been working on moving my family towards more natural foods and products. We are eating less processed foods and more organic. I have been trying to find more natural beauty products and have been very curious about this guide. I would love to win it and learn more about getting these nasty chemicals our of our house! I am trying to nourish my body with coconut oil for face and skin and a mostly primal diet. After a dx of rosacea years ago, and spending hours (days?) researching other symptoms, I went gluten and yeast free which solved many problems. I’m trying no poo, but still working out the right “recipe” to get my long hair manageable. I’m looking for other natural solutions – deodorant, pore reduction, toothpaste. My mom had breast cancer this year (healthy now, thankfully!) and now that it’s in my family history, I’m even more determined to quit the chemicals! I just started taking fermented cod liver oil/butter blend and washing with coconut oil! So far, so good! Natural health care is a new interest of mine. I would love to learn more! I am hoping my library will order one. I have struggled with acne all my life and would love to try skintervention!! So far, I’ve started making my own face/body wash using local raw honey, castile soap, vitamin e oil, & essential oil. I’ve also made my own face moisturizer using coconut oil, vitamin e oil, & essential oil. I make my own laundry soap & dish soap. I’ve also made my own insect repellant & household cleansers. I’m off to a good start but I really need the information about diet and nutrition for healthier digestion & skin. I also want to learn about the oil cleansing method. I would also like to try no’poo but I’m nervous about having to go to work with greasy hair for a few weeks….not sure how that will go over with co-workers. I don’t actually do anything which is why I need this book. I have fair celtic skin and the Roseacea that often goes along with Celtic skin. Right now I look like Rudolph the Red Nosed Reindeer. Thanks goodness I work in an OR and my red nose is covered by a surgical mask for most of the day. I do take a daily vitamin and fish oil but that is pretty much it. 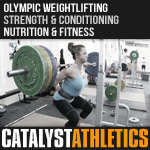 Can’t wait to try her methods, I already do some of this but the full guide would be awesome! Oh man, I have been wanting to get this guide for awhile. I have been using OCM for a few months now and have definitely noticed improvements, although I’m still finding the perfect balance for my skin. Haven’t tried Coconut oil cleansing yet, but am using Dr. Woods’ black soap with shea butter. Really want to see what other things can help, would love to review a copy of skintervention!! This is the next step in my health journey!! I want to overhaul my products, and would love the guide to help me!! Thank you for all the links, as a fellow Canadian, they are so helpful!!! Thank you for such an informative and complete blog.